We front the fundamental shift from the outdated healthcare system to a whole new environment infused with digital innovations and technological footing. I have already started introducing the core principles, which structure a digital strategy in line with this shift. In particular, in the previous part of this article I disclosed two key elements of the healthcare industry, patients and healthcare providers, and paid attention to the most important factors that influence the design of your digital strategy. I continue exploring the other three principle elements that impact your strategy and the future architecture of the healthcare system in general. They are Competition, Data and Value. Healthcare service providers confront different challenges that grow from insufficient funding, strained competition, quick pace of technology changes, the rise of value based payment programs and many more. Most of these challenges are changes dictated by a fast changing world, and industry players should look around for new strategic partnerships to stay competitive. For instance, clinics and hospitals compile and store massive data, but usually cope with restrained funding and insufficient resources. On the other side, manufacturers and IT giants, that supply tech basis for industry performance, face the pressure that emerges from the permanent need to invest into new technology development and the need to have live data to ground their innovations on massive flows of up-to-date information. Thus we can see that partnership between the tech sector and the healthcare industry is vital for both, as it enables enough sources to provide varied solutions relying on multiple requirements and needs of healthcare environment. At the same time, these parties reduce costs substantially by merging with existing high-tech solutions; for example, healthcare and fitness devices like Apple Watch, Jawbone or Fitbit, that effectively manage large amounts of patients’ data. Another example of such win-win solutions is CF-medication, engineered by a Dutch medical center in cooperation with a large pharmaceutical company. This app provides optimized doctor-to-patient communication with constantly updated records, e-prescriptions and a medical adherence management feature. Data management has always been a complex issue in the healthcare industry. The volume of the information received, stored and used by healthcare institutions is massive. It’s clear that keeping all the data in paper format complicates its management, makes it hard for doctors and patients to access the information they need and turns data analysis into an expensive enterprise. Not to mention the challenges arising at the exchange of information between healthcare bodies. Basically, this is the reason why going digital is essential in consideration with shifting to effective data management and grooming the future of online workflow. In fact, implementing digital strategies may be the only effective way to resolve challenges mentioned above. We live in the world of “smart everything,” when information is gathered in every possible way: contact lenses monitoring glucose levels, smart monitoring of medication adherence behavior, heart rate monitoring patch, insole sensors measuring weight, balance, temperature and so on. Acquiring this information is not a difficult task at all. What makes it complicated is the need to organize, store, monitor, transfer, analyze and provide secure access to this information. Therefore, the role of digital transformation that provides opportunities to handle these challenges effectively increases greatly. As soon as you removed data from dusty shelves and converted it into the terabytes of digital information, you have to think about HIPAA compliant cloud data storage. Here is a helpful article on how to find such storage. Turning papers into e-copies and storing them in the cloud provides quick and secure access for both healthcare providers and patients. Digital format makes your information contribute to your results and lets you maximize the benefits of using it. A great example of how cloud-based data storage adds to your business is IBM Watson, an artificial intelligence engine, which can help healthcare providers to increase the speed and precision of decision-making, perform distant medical monitoring and even process some routine medical tasks like scheduling of doctor visits. Another example to consider is Kanta, the central electronic health records (EHR) archive in Finland, where all medical bodies store their EHR data. Any Finnish citizen has 24/7 access to their healthcare records. This data can be easily transferred from one municipal hospital to another when someone relocates. You can imagine more benefits from having such a system on-site. In general, efficient organization and structuring of on-time delivered data is a great help to client support centers. It provides optimization for the work with clients and adds agility to healthcare in general. Cloud-based storage provides great opportunities for data management. However, the use of this digital environment is possible only through a set of interfaces adjusted to the needs and requirements of healthcare service providers, doctors and patients. If you’ve already been using data and services management software systems like EMIS, you can contact your provider to discuss what system upgrades may fit your needs. If you are still considering what interface to use, you may be interested to check what’s available on the market or approach your digital strategy consultancy partner to consider custom options. Value is the key element that determines the business strategy directed to digital transformation in healthcare ecosystems. Presumably, any alignment in this particular industry is to be value-driven against volume-driven. However, we can outline how industry-wide adoption of high-tech adds to each stage or industry communication and operations. First of all, the adoption on digital technologies allows for improved service outcomes due to increased delivery speed and effectiveness. The survey by Deloitte indicates that both healthcare providers and patients require ready-to-go solutions with user-friendly interface and communication opportunities. It proves that the healthcare industry will capitalize on smart but easy-to-use gadgets and apps that bring greater engagement, hence, healthier populations. 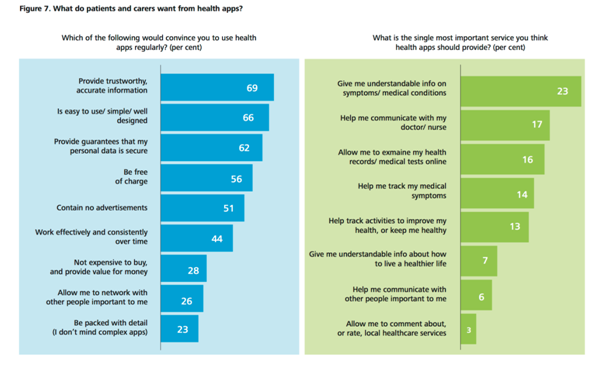 Source: Deloitte Centre for Health Solutions, © Deloitte LLC. Communication apps and gadgets help patients to contact doctors regardless of scheduled appointments and receive necessary support 24/7. They also provide monitoring and engagement in treatment. The apps enhance medical adherence, promote patients’ confidence and increase trusts, and, as a result, encourage patients to adjust to a healthier lifestyle. Availability and easy access to data, beyond doubt, has a positive impact on the decision-making process. It allows doctors to receive constantly updated information about patients and they can consult with colleagues in real time. Therefore, it helps to be more knowledgeable because then there can be error-free decisions and improved diagnosis quality and speed. In its turn, accurate diagnosis increases efficiency of services and trustworthiness of the healthcare system in general. Digital technologies provide great opportunities for preventive healthcare development. Due to effective information management and overall acceleration of performance, new healthcare environments with digital technologies at hand provide opportunities for analysis, modeling, and predicting and preventing of epidemics, remissions, etc. The value of these opportunities is hard to underestimate, because eventually they lead to an overall wellness increase not only for particular nations and populations, but for humanity as a whole.